Nearly everyone has fond memories of Ferris Wheel rides as young children. 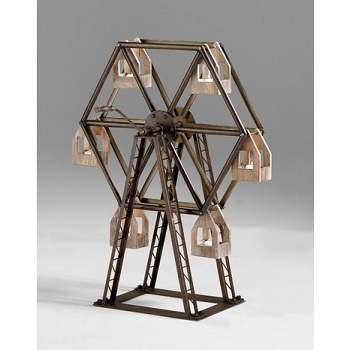 This Ferris Wheel sculpture made from iron and wood is a beautiful representation of a widely recognised fairground feature. It even has a handle with which to turn the wheel around making it dynamic and fun. The mixture of metal and wood adds a decorative quality that will fit well in most décor schemes, especially those with a theme related to traditional fun and games. The first recognisable Ferris Wheel was designed by George Washington Gale Ferris, Jr. for the 1893 World’s Columbian Exposition in Chicago. Since then the big wheels have developed further and also grown much bigger. The largest in the world is currently the 165-metre (541 ft) Singapore Flyer. Perhaps one of the most famous Ferris Wheels in the Western World is the London Eye, on the banks of the River Thames in England’s capital city. This Ferris Wheel sculpture is certain not as spectacular in size but it is pretty special as a decorative feature for a bedroom or living room. You can buy it from here: Ferris Wheel Sculpture. Size: 34.5″ H x 12″ W x 23.75″ D.